Sunday January 27th 1889 I was fearfully low spirited all day and sick in the bargain It was a wintry day. Ott & Fan came over in the afternoon and brought the children with them. John & Hatt were in the country. Will and I talked all the evening. 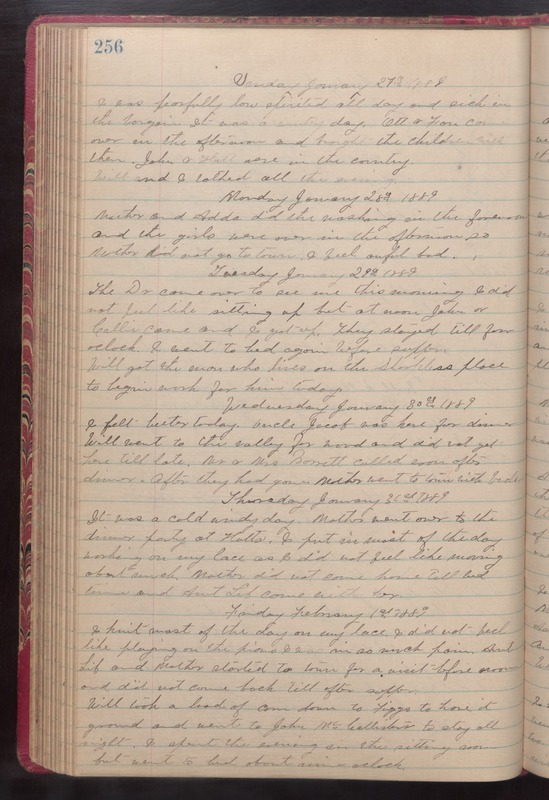 Monday January 28th 1889 Mother and Adda did the washing in the forenoon and the girls were over in the afternoon so Mother did not go to town. I feel awful bad. Tuesday January 29th 1889 The Dr came over to see me this morning I did not feel like sitting up but at noon John & Callie came and I got up. They stayed till four oclock. I went to bed again before supper. Will got the man who lives on the Sharpless place to begin work for him today. Wednesday January 30th 1889 I feel better today. Uncle Jacob was here for dinner Will went the valley for wood and did not get here till late. Mr & Mrs Barrett called soon after dinner. After they had gone Mother went to town with Uncle. Thursday January 31st 1889 It was a cold windy day. Mother went over to the dinner party at Hatts. I put in most of the day working on my lace as I did not feel like moving about much. Mother did not come home till bed time and Aunt Lib come with her. Friday February 1st 1889 I knit most of the day on my lace. I did not feel like playing on the piano I was in so much pain. Aunt Lib and Mother started to town for a visit before noon and did not come back till after supper. Will took a load of corn down to Figgs to have it ground and went to John McCollisters to stay all night. I spent the evening in the sitting room but went to bed about nine oclock.